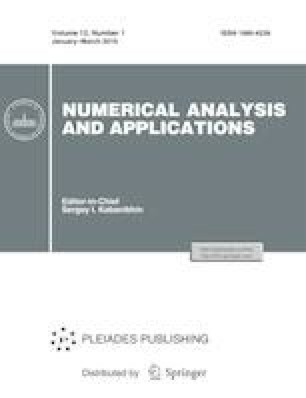 In this paper, we obtain conditions of existence and uniqueness of periodic solutions for a nonlinear fourth-order differential equation utilizing explicit Green’s function and fixed point index theorem combining with operator spectral theorem. We discuss an iteration method for constant coefficient nonlinear differential equations and establish the theorem on the existence of positive solutions for a fourth-order boundary value problem with a variable parameter. Finally, we give an example to illustrate our results. Russian Text © N. Bouteraa, S. Benaicha, 2019, published in Sibirskii Zhurnal Vychislitel’noi Matematiki, 2019, Vol. 22, No. 1, pp. 1–14.